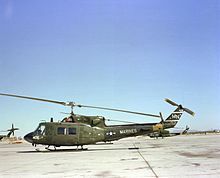 Unlike in the Canadian Forces, in US service, the UH-1N retained the official name “Iroquois” from the single–engine UH-1 variants, although US service personnel refer to the aircraft as a “Huey” or “Twin Huey”. The UH-1N’s main rotor is powered by a PT6T-3/T400 Turbo Twin Pac made up of two Pratt & Whitney Canada PT6 turboshaft engines that drive a single output shaft. They are capable of producing up to 1,342 kW (1,800 shp). Should one engine fail the remaining engine can deliver 671 kW (900 shp) for 30 minutes or 571 kW (765 shp) enabling the UH-1N to maintain cruise performance at maximum weight. The United States Marine Corps (USMC) modified a large number of their UH-1Ns with a Stability Control Augmentation System (SCAS) which provides servo inputs to the rotor head to help stabilize the aircraft during flight. This modification removed the gyroscopic “Stabilization Bar” on top of the main rotor head, instead relying on the computer system for stability. In August 2013, the Air Force said they were close to finalizing a plan to sustain and modernize their UH-1Ns for the next six to ten years. The plan was to sustain the fleet, address flight and safety mandates, investigate modest improvements in capabilities, and reduce capability gaps. 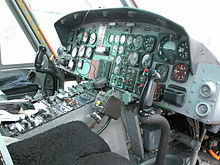 While the Huey is one of the oldest platforms in the service, keeping the fleet going was seen as having “minimal risk.” Fleet-wide upgrades included night vision compatible cockpit lighting, crash worthy seats for flight engineers, and installation of a helicopter terrain awareness warning system and traffic collision avoidance device. The Air Force was also in the process of further acquiring ex-Marine Corps UH-1N models. The Marines were working out a strategy to transfer as many as 26 helicopters to the Air Force to either add them to their active fleet or keep them in reserve. The U.S. Marine Corps planned to retire the UH-1N Iroquois by September 2014 after 43 years of service. HMLA-773 (Marine Light Attack Helicopter Squadron 773) was the last Marine squadron operating them, with their last deployment occurring in 2013 where two helicopters sailed on a Royal Netherlands Navy ship for an African Partnership Station deployment. 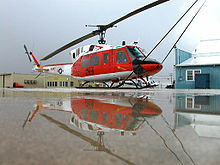 Deliveries began to the Navy and Marine Corps in 1971 totaling 205 UH-1Ns and six VH-1N executive transports for Marine Helicopter Squadron One. 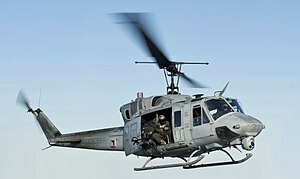 The UH-1N was replaced by the upgraded UH-1Y Venom; ten are remanufactured N-model airframes, after which the Marines decided to procure new-built Y-model airframes. Five unarmed HH-1N versions remained in use by the Marines until they were also replaced by UH-1Ys and retired in 2015, the only HH-1Ns remaining from 44 that were converted from 38 UH-1Ns and the six VH-1Ns. The last combat deployment of the UH-1N by the Marines was to Afghanistan in 2010. The Marines retired the UH-1N during a “sundown ceremony” at Naval Air Station Joint Reserve Base New Orleans on 28 August 2014. In March 2013, the U.S. Air Force operated 62 UH-1N Hueys: 25 provide security at ICBM sites; 19 are stationed at Joint Base Andrews to evacuate Washington-based government officials in emergencies; and 18 are used for testing and training. Since most were purchased in 1969, the Air Force has been seeking a replacement. Prime candidates include the Sikorsky HH-60U version of the UH-60 Black Hawk and the Boeing/Leonardo MH-139 version of the AW139; the requirement is for 84 helicopters. On 13 July 2017, the Air Force released a request for proposals for a UH-1N replacement. A contract is to be awarded in 2018, with initial operational capability in 2020. Initial production model, used by the USAF, USN, and USMC. Over the years the primary operators, the USMC has developed a number of upgrades for the aircraft including improved avionics, defenses, and a FLIR turret. The USAF planned to replace their UH-1Ns with the Common Vertical Lift Support Platform to support the service’s ICBM activities, but is now examining a life extension for their current fleet.